Back when Fantastic Mr. Fox debuted a few months ago, the following thought occurred to me: “Wes Anderson is forever doomed to make Wes Anderson movies.” Here’s a director who did all he could to step outside his comfort zone, adapting someone else’s work for the first time—in this case, that of Roald Dahl, an author with his own singularity—and using stop-motion animation, a painstaking collaborative process that seems like it should suppress his auteurist instincts. Alas, Fantastic Mr. Fox is a Wes Anderson movie from frame one, because he found a way to square his sensibility with Dahl’s (or, as detractors might put it, “shoehorn it in”) and wrangle a team of animators into bringing his homemade, obsessively detailed Rankin-Bass universe to life. There are two ways to look at it: Anderson is either to be praised for his consistency of vision, or damned for painting himself into a stifling creative corner. This may explain why the maker of such gentle, eccentric, lovingly particular comedies remains one of the more polarizing directors in the business. Back in 1996, when Anderson’s Bottle Rocket was released, it was easy enough to detect a major talent in the making, but too few people saw it to draw the battle lines. In spite of the sponsorship of a few big names—producer James L. Brooks and actor James Caan, who lent his swagger to the small but crucial role of Mr. Henry—the film collected only a handful of stellar reviews and an unexpectedly forward-thinking MTV Movie Award for Best New Filmmaker. Yet for the few who saw and championed the film, it still holds a special place in Anderson’s filmography. In part, that’s because it seemed so fresh at the time, and because it thoroughly set the table for his later work. But mainly, it’s because its story of outsiders banding together for their first big score was, for all its quirks, clearly personal. It’s sometimes hard to remember that Anderson, now the poster boy for the cloistered New York (and New Yorker) elite, and his writing partner and star, Owen Wilson, were once just an odd pair of Texans trying to get their careers off the ground. In that sense, Bottle Rocket is about the perils and pleasures of creative endeavors, commenting on itself as wryly as it gooses the heist genre. Take the line quoted above, uttered near the end of the movie. (The spoiler-averse can take this as their cue to leave.) By that point, we’ve gotten to know Dignan, the loveable dreamer and schemer that Wilson would essentially recreate in many minor variations once he got to Hollywood. (My cohort Noel Murray used to retitle his films thusly: Shanghai Noon became Dignan Goes West, Anaconda became Dignan Vs. The Giant Snake, etc.) A would-be master thief—his detailed plans stretch far as 75 years down the road—Dignan ends up deposited in a minimum-security prison, serving 23 months for a hilariously botched armed robbery. The line comes during the denouement, when his partners-in-crime, best friend Anthony (Luke Wilson) and wheelman Bob (Robert Musgrave), pay him a visit out on the yard. “We did it, though, didn’t we?” says Dignan wistfully, and it’s one of those inimitable Wes Anderson moments, when something whimsical and absurd is also tinged with very real sweetness and truth. In spite of Dignan’s scrupulous planning, not a single thing went right with the robbery, yet just the act of following through on his vision—of bringing it out of the realm of make-believe and really being crooks, however incompetent—is satisfaction enough. With their getaway driver in place, the men whet their appetite via the most adorable robbery of all time: A stick-up at a strip-mall bookstore. A few bumps aside, it’s actually a successful job, owing mostly to the fact that the proprietor and clerks at such a modest, low-yield business probably never expected to be a target for criminal masterminds. But it’s good enough to send them on the lam while the heat dies down. Of course, the level of police interest in the case is likely equivalent to the resources devoted to tracking down whoever stole The Dude’s car in The Big Lebowski, but the whole idea of being on the lam makes Dignan giddy with excitement. Virtually the entire second act strands the trio in a motel, where Anthony strikes up a sweet relationship with a housekeeper named Ines (Lumi Cavazos), who doesn’t speak much English. (Their meeting leads to my favorite exchange in the whole movie: “What part of Mexico are you from?” “Paraguay.”) All of this is prelude to hooking up with the fabled Mr. Henry (James Caan), who employed Dignan in the landscaping company that serves as a front for a crime syndicate. Bottle Rocket introduces plenty of Anderson’s visual and thematic touches, but that middle section stays with me the most, both because it daringly halts the film’s narrative momentum when it might otherwise be gathering steam, and because Anderson would never attempt anything like it again. Anderson’s films are frequently about men of action and ambition—think Max Fischer in Rushmore, the precocious Tenenbaum children, or the Fantastic Mr. Fox—and Dignan certainly stands proudly among them. Yet Bottle Rocket allows this generous space for Dignan and the gang to stop and play, and for the audience to learn something more about them. One of Anderson’s great strengths is his ability to pack a lot of humor and melancholy into short, expressive bursts of montage, or even just a look or a concise bit of dialogue. Bottle Rocket isn’t in any hurry to get to Mr. Henry and the big score; instead, there are the unexpected grace notes of Anthony saved by love, or Dignan shooting off fireworks in the field outside the motel. It’s the sort of whimsical time-out that you’d more likely expect to find in a Takeshi Kitano movie—like, say, the New Cult Canon entry Sonatine—but given that Anderson was a first-timer, you have to admire his quiet confidence in slowing the movie down before heading into the big payoff. And what a payoff Dignan has planned! Now, as someone with a low threshold for indie preciousness, I can see where some think Anderson’s films cross the border into Quirkytown, U.S.A., a whimsical place that only exists in the minds of oxygen-deprived Sundance denizens. But while it’s true that his films take place in rarified environments—a private boarding school, a Manhattan townhouse, a tastefully appointed tree—the crucial difference is that Anderson’s heroes always have their grand plans spoiled by harsh realities. Think of the great scene in Rushmore where Max’s teacher, fed up with his advances, spoils his crush by confronting him with the truth about how real adult relationships work. Or Mr. Fox, who does everything he can to lead a different kind of life, but can’t transcend his animal nature. 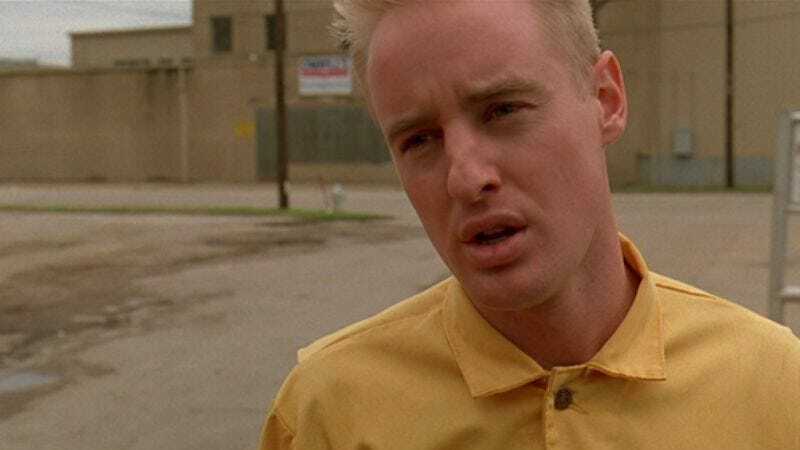 In Bottle Rocket, Mr. Henry represents that cold splash of water, even though he appears in one scene in a karate robe, white tube socks, and sandals. Mr. Henry makes easy pickings of poor Dignan, and as played by Caan with all the swaggering machismo of his Godfather character, he brings the film some much-needed ballast. Otherwise, the entire movie would be dictated by Dignan’s pie-in-the-sky fantasies. Now six films into his career and counting, Anderson continues to refine (rather than transform) his style with each successive effort, but only in minute variations; Bottle Rocket is the rare example of a filmmaker whose sensibility was almost fully developed from the word “go.” Within a typically economical 90 minutes, Anderson packs a lot of memorable sequences and rich subplots; the relationship between Bob and his bullying brother Future Man (Andrew Wilson), for one, is a funny and moving little arc in itself, and his masterful use of pop songs against the action is already firmly in place here. But mostly, Bottle Rocket works as a warm, affectionate tribute to misfits who put on their matching yellow jumpsuits and commit to doing a job together. Whether they pull it off or not is beside the point.